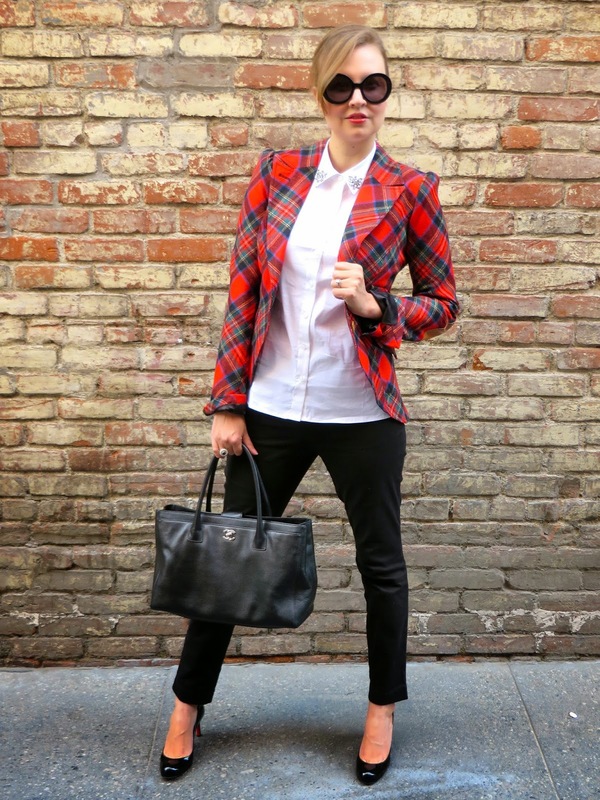 Hello Katie Girl: So Much Plaid, So Little Time! So Much Plaid, So Little Time! You can wear plaid all year round depending on the fabric and the color, but bright red wool plaid with green accents like the one featured on my blazer today screams "Christmas!" so the window for wearing it is small. I have a lot plaid, a lot of red and green plaid in particular, so I've been trying to fit it all in this week, which has created somewhat of a plaid-a-palooza. Let me just say briefly that I love Smythe, the designer of this blazer. The fit of their jackets is amazing, although they do run small. They are also designed and made in Canada, which is something that I love to support. I've become somewhat of a collector of their blazers over the years, but this one is by far my favorite. Getting back to my cramming in all of the plaid that one could possibly stand into the course of a week, if you can stand it, I have one more plaid ensemble up my sleeve for Christmas and then I promise to refrain from donning the pattern for a little while! Plaid is sort of like an addiction; it's hard to resit its classic charm. This blazer is FAB! I love the cut of Smythe jackets. Especially love the pictures of you standing by the decorated trees! Thank you Jane! I also love the cut of Smythe... They just seem to fit perfectly without any tailoring. Now that's a Christmas blazer -- the colors are right on the money. I love how it looks from the back as well. Thanks Carmen! I appreciate you stopping by and Happy Holidays! Love this blazer on you, it has a great shape and it fits you perfectly, you look fab! Thanks Nora! This is definitely my favorite blazer, but I can only really break it out during the holidays!